The construction of the first building of the Moscow International Medical Cluster has been completed at Skolkovo. “The first clinical and diagnostic building, equipped with the most modern technology, has been completed in Skolkovo’s medical cluster. Plus, the most modern control center in Russia has been established here. One of the best and oldest Israeli clinics, Hadassah, will be the operator of the new diagnostic center. I hope that, in the next few months, specialists will equip the center and hire personnel, so that the clinic can have its first patients,” Mayor of Moscow Sergey Sobyanin said. The construction of the first pilot clinic (diagnostic center) of the Moscow International Medical Cluster in Skolkovo took place from August 2016 until March 2018. The functional area of the four-story complex amounts to 10,546.7 square meters. Aside from doctor’s offices, the building features a conference hall (with LED video walls for congresses, presentations, seminars, videoconferences and so on), a cafe that can seat 100 people, a kitchen with auxiliary rooms, an atrium (winter garden) with a public area and a cafe for 100 people, a laundry room, a training (simulation) center, and an administrative block. During the preliminary stage, medical staff at the Hadassah clinic will comprise 40 people – doctors, nurses, paramedics, and other specialists. Out of them, 10 people (25 percent) are foreign doctors that have work permits for countries that are part of the OECD. Another 12 people (30 percent) are Russian specialists who received Hadassah training. The clinic’s patients will have access to the full cycle of modern diagnostic studies. This will let the clinic’s staff diagnose illnesses at very early stages and take into account individual differences between patients. Patients will be accompanied by personal coordinates – personal assistants who will help them resolve all issues that come up. The clinic will be accepting its first patients in the fall of 2018. Zaryadye Park has opened a unique artistic installation – an ice cave. Visitors end up in a real kingdom of ice and snow, feel the power of northern nature, and appreciate the beauty of crystals that cover the cave’s columns and walls. Special lighting makes the walls flicker, and makes the tunnels appear mysterious. “Now you can feel like a real north pole explorer without leaving Moscow. I think that this interesting, natural gem in our park will be liked by the visitors and will also become an attraction of our city,” said Alexander Kibovsky, Moscow Minister and Head of the Department of Culture. 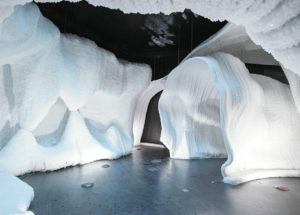 Staff from Diller Scofidio + Renfro, a New York design studio, came up with the idea to create an ice cave. Ice and snow crystals form in the cave naturally. This was accomplished thanks to a structure made out of hundreds of metal pipes stretching over a total length of 13.7 kilometers. The pipes are there for circulating a special substance throughout the space, which is regulated in terms of speed and temperature. There were several stages of ice accumulation. The walls of the cave are covered with about 70 tons of water. Visitors who come to the ice cave should bring a warm jacket with them, since the temperature inside can drop down to -5 degrees Celsius. The Church of the New Martyrs and Confessors of the Russian Church was built on the territory of the Sretensky Monastery in the center of Moscow. It was designed with the help of building information modeling, or BIM. The Sretensky Monastery is over 600 years old. The old church used to fill up to maximum capacity, especially during Orthodox holidays, and people used to stand outside in the rain or snow during services. So a new church was erected nearby, on Bolshaya Lubyanka 17. It’s dedicated to the memory of those who have their lives to defending Christianity when Christians were under persecution. The church is a monument to the victory of Jesus Christ and his disciples – new martyrs and confessors. The church is impressive in terms of beauty and size. The central dome weighs 25 tons. It was lifted 50 meters up to its current location with a special crane that weighed 500 tons. The church is decorated with golden domes, which were gilded with galvanic technology. This technique doesn’t just gild the surface, but ensures that the molecules actually penetrate the surface area. The church is lined with stone carvings from white Vladimir limestone. The same stone was used to build the ancient white stone cathedrals of Vladimir, Suzdal, and Moscow. The building has five floors, including a basement. 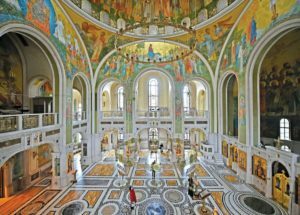 It houses the main and small halls for services, the antechurch, a katholikon (middle part of the temple), a soleas, an altar, choirs, and representative spaces. The church has a unique baptismal font that comprises three parts. Two of them are dry, and the central part is filled with water for baptisms. Over 160 people were baptised here in one year. 47 icons have been made in Russian-Byzantine style specially for the church. Before plastering, it was decided to use 3D-mapping. In audiovisual art, 3D-mapping is a projection technology used to turn objects into a display surface for video projection. The specialists created a computer mockup of the iconography for walls and the dome. At night, the images of saints were projected on the walls to make the originals as precise as possible. The artists only started working after 3D-mapping was complete. BIM modeling enabled the designers to cover up utility networks. All of the networks are behind the walls and in the ceiling, and there are special access doors that can be used for repairs and servicing the building. There are utility spaces underneath the church. The cathedral has Wi-Fi, and priests have microphones and tablets for controlling light and sound. Services can be broadcast not only on the street, but also online. These technologies are already being implemented in Moscow. The whole cathedral is equipped with invisible columns, and the lower church alone has about 36 of them. Here, shoppers can buy t-shirts from the UT collection and feel like designers or artists. The special zone occupies about 120 square meters in Uniqlo’s flagship store in the Atrium shopping center, and its design fits right into the interior. The space houses the most interesting and bold collections developed with key museums and modern artists. The special zone now has a UTme corner. Here, you can customize a white Uniqlo t-shirt. 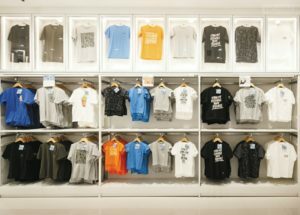 Every customer can create and apply their own unique print: text, a picture, a sticker created by Uniqlo and the New York Museum of Modern Art, or Disney and PEANUTS images created especially for UTme – everything you can imagine. The highest observation point in Europe with a 360 degree view opened at the Federation Tower in the Moscow City business center. There is also an ice cream factory there, where guests can see every stage of production and take ice cream home with them. The Federation Tower is a complex of two buildings – Tower East and Tower West, located on the stylobate (the general lower part of the building). The 101-story Tower East is 373.4 meters tall. The observation point is on the 89th floor, and it features breathtaking views of Moscow. It is currently the highest observation point in Europe. It’s a unique space for visitors who come alone or with families, and ios wheelchair accessible. The experience begins even before you enter the observation point. You can get to the 89th floor in just a few seconds. High-speed elevators travel at 8 meters a second – a feeling similar to flying on a plane. From the 89th floor, guests get a fantastic 360 degree view of Moscow. The observation point is in the city center, 4km from the Kremlin, so it offers the best views of the city and its main attractions. Visitors can also see the city at night. The observation point is more than just a great view of the city. It’s also a cultural, social, and educational project. Visitors who purchase tickets get a whole package of services. The ticket includes a trip to the only ice cream factory in the world located on the 89th floor, along with the observation point. Visitors can learn about how ice cream is made, and take home the ice cream that they see made in front of them. There will be several modern entertainment zones here. 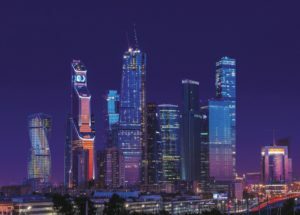 They include a projection show with an immersive effect, and interactive guide in an augmented reality format available in different languages, an exhibition of virtual 3D-models of Moscow City towers that are erected right in front of your eyes, as well as a photo studio where every visitor is photographed in front of some of the best views in the city. Another big highlight is the projection show. In just three minutes, it will introduce the guests to the history of Moscow – the most important steps in its development from the times of Yuri Dolgorukiy up until the present – and will place the guests in the very center of these exciting historical events. The projection show is a complete film created with 3D technology. The space will also have an eco-restaurant with dishes made out of fresh, natural farm produce, along with a cafe and a souvenir shop. The observation point is next to three metro stations, a Moscow Central Circle (MCC) platform, a bus stop, and a pier. There is a spacious underground parking spot for drivers. A virtual chat bot with free tourist routes and quests is now up and running in Moscow. It was developed by Mosgortur and the Moscow Department of Culture for the 2018 FIFA World Cup. But it’s going to continue helping Moscow residents and tourists after the tournament is over. The bot will take users along streets in the center of the city, and the walks will include key city attractions, museums, and architectural monuments . The chat bot is available via http://mosroutes.com. Free tours are available in Russian, English, and Spanish. Each tour lasts 1.5-2.5 hours. The routes have been put together by professional tour guides, who have been organizing educational walks around the city for many years. 600 electric buses will be navigating the capital’s streets by the end of 2019. 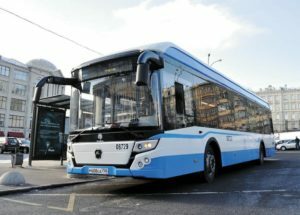 If the city purchases 300 electric buses a year, then by the end of next year Moscow will be in the top 3 cities in the US and Europe with the largest shares of electric buses, according to mos.ru. The first electric buses will be on the roads by this fall. They will be launched on routes No. 7, 34k, 42, 76, 36, 83, 73, and 80. Some of these routes will be fully serviced by electric buses. Moreover, the city is determined to keep trolley bus drivers, retraining them as electric bus drivers. In the future, this type of transportation may be self-driving. Several global companies are already working on them. Russian enterprises will develop a model that will successfully pass all the necessary tests. Electric buses are a new noiseless and environmentally friendly mode of transportation that lowers harmful emissions volumes in the atmosphere. In 2021, Moscow will stop purchasing buses with diesel internal combustion engines for use on city passenger transport routes and will only purchase electric buses. NIKITA. This restaurant on Bolshaya Nikitskaya perfectly blends the atmosphere of pre-revolutionary Moscow with traditional Russian cuisine. 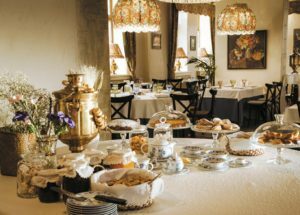 The restaurant is located in an early 20th century manor house. The walls of the building dictate the mood and its interior solutions. Historically, wealthy merchants lived in this part of Bolshaya Nikitskaya, which is why Nikita also looks like a home where everything is fitted to the tastes of the wealthy. The relaxed atmosphere on the first floor, which is filled with sunlight, is reminiscent of a veranda from a summer manor house straight out of a Chekhov or Bunin book. The more elegant second floor with old fireplaces, vintage lamps, and antique buffets is made for festive lunches and evenings. KEEPISH. The new gastropub’s motto is “from friends, for friends.” The food, reasonable prices for dishes made with quality products, and the playlist all create an atmosphere similar to Ibiza in the 70s or 80s. The wine list combines autochthonous varieties from all over the world with biodynamics. The establishment’s motto also applies to product quality: the crabs and four different kinds of oysters are brought over on private boats, and the poultry comes from farms outside of Moscow. British chef Oliver Dollard (15 Kitchen + Bar, Sempre), who is famous for his experiments with seasonal products, is in charge of the kitchen. Raw, Local and Modern are the three key concepts behind the menu, which is separated into three parts: raw, grill and delicacies. The interior features wood, moss, and brick, along with a lot of air. PRIMEBEEF. 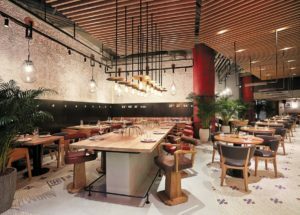 A meat stand and bar called PRIMEBEEF Bar, from the creators of the high-quality Russian marbled beef brand PRIMEBEEF, has opened inside the food court StrEAT. Here you can order dishes on the menu, pick out your own slice of steak, and purchase fresh beef from the stand. There is also a josper (a grill oven where meat is cooked over coals). The menu features meat dishes (including burgers), light salads, vegetables and grilled corn, as well as fries. Aside from the usual steaks and burgers, the StrEAT bar has new original dishes as well. For example, the juicy Hawaiian Burger with fresh vegetables, Cheddar cheese, honey-mustard sauce and baked pineapple (400 rub. ), the Italian Burger on a brioche bun with Gouda cheese and caramelized onions (400 rub. ), and the Sandwich Prime with tender beef in a sweet-spicy marinade on a crispy ciabatta (500 rub.). PRIMEBEEF is a family business with 11 farms for breeding and raising bull calves in the Voronezh and Kaluga regions. Over the past few years, PRIMEBEEF has become a famous brand among people who understand and appreciate quality products. Moreover, the company is one of the top suppliers of marbled beef for restaurants in Moscow. WOW. 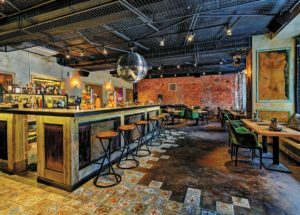 A new unique project that includes a restaurant, club, bar, and a dinner show has opened its doors at the Badayev factory. The owners promise to bring aesthetics and luxury back into Moscow nightlife. WOW has managed to combine the glitter of Gatsby-style parties with unrestrained Ibiza nights. The club and restaurant will surprise its guests from dusk to dawn, from the time you step into the establishment to the very last cocktail as you wait for a cab home. It’s set to be the most exciting thing to happen to Moscow’s club life in 2018. This format has never been implemented in Moscow to such an extent: WOW stretches over an area of 1,500 square meters and can accommodate over 1,000 guests. After coming inside, the guests are immediately immersed in an atmosphere of a festive performance that starts at 8.00 pm and doesn’t end until way late into the night. Over the course of several hours, the stage hosts breathtaking shows with professional actors, singers, illusionists, air gymnasts, and circus performance from the world-famous Cirque du Soleil, participants of America’s Got Talent. Overall, there are over 30 artists participating in the show. Once midnight rolls around, the place is transformed into a huge club with DJ sets, champagne, and dancing until dawn. WOW has two main areas. The first is a huge two-story hall with a dance floor, comfortable couches for having dinner with friends, a bar stand, and a stage with a thirteen-meter wall for video broadcasts. The second area is a VIP studio that is like a full-fledged apartment with a private DJ setup. The kitchen serves European and Pan Asian dishes that are easy to share with friends. Giorgio Alberto, one of the world’s best mixologists, is in charge of the bar. He has put together drink menus for Four Seasons (Dubai), Buddha Bar (Moscow, Paris, Dubai, Berlin), and Marriott Grand Hotel (Moscow, Paris). NAVOLNE. A three-story, high-end restaurant with an original atmosphere, unique interior design, and a unique food selection. The loft space with high ceilings and windows overlooking the Moscow River is finished in art deco style. The first floor has a cafe: the perfect space for a cup of tea, or coffee and dessert. There are cakes, pastries, and cookies to choose from on display. A staircase of fame, with steps featuring the names of famous people, leads you upstairs. The second floor houses the restaurant with another display, which features fish, oysters, crabs, shrimp, and other seafood. There is an impressive collection of local and international Soho awards on the shelf, along with diplomas and quality certificates. The main attraction of the third floor is the open kitchen. Guests can look at the chef work from anywhere in the room, watching as their dishes are prepared. There is also an exit that leads to the terrace, which features an entertainment program Soho Show every weekend. CRABBER. This new project by the famous Russian restaurateur Arkady Novikov has opened its doors in the Belaya Ploshyad business square by Belorusskaya metro station. The restaurant promises to be a gathering spot for young professionals who come to the Belaya Ploshyad offices every day. The restaurant’s symbol is a crab fisher with his catch – welcoming and simple. All crabs come from the Crabber farm, which has several kinds of crabs. This setup lets guests enjoy quality crabs at reasonable prices. The menu features five types of oysters (from 120 rub per oyster) and four types of crab (starting at 450 rub for 100 g.), sea urchins (200 rub) and scallops (250 rub), curry shrimp with basmati rice (900 rub), soup with seafood and crab (1,150 rub), and much more. The wine and drinks lists stress well-known selections, and every drink is intended to ideally complement the seafood items on the main menu. 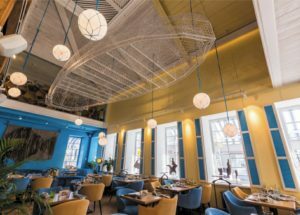 The loft-style space with panoramic windows, the aquarium with seagulls where live crabs are kept – Crabber’s design is one of the things that make the place so great, along with affordable prices and great seafood. CERETTO MORE. This new restaurant has been created to put all your questions about fish to rest. Muscovites like to jokingly say that Moscow is a port of seven seas, but there is no sea around Russia’s capital. There are no fish swimming up to the shores, and no muscular fishermen pulling nets out of the waters. 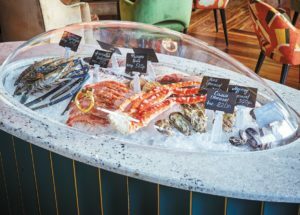 To compensate for the severe lack of sea in Moscow, Vladimir, Sidorov, the head chef at Ceretto More, came up with a menu that brings together all the main culinary hits – flavorful, juicy, delicious. The interior of the new restaurant adheres to one main idea: telling visitors about the sea, waves, and docks. And a bit about fishermen and fisherwomen. The restaurant is located in an old manor house on Pyatnitskaya. The ideal proportions of rooms, high ceilings, and panoramic windows serve as excellent decorations for presenting fish dishes. For centuries, people all over the world have been serving dishes out of raw fish. 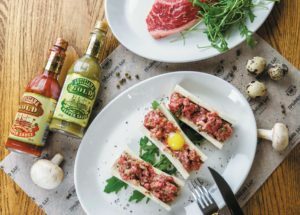 The Siberian stroganina, the Italian carpaccio, Latin American ceviche and Japanese sushi – these are all famous dishes prepared with raw fish.